Why you should become a POPS Member! 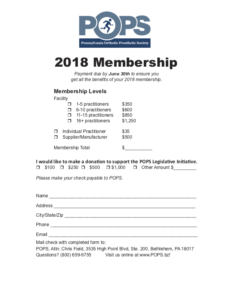 POPS membership allows collaboration with other orthotists, prosthetists, pedorthists and orthotic fitters in Pennsylvania on common interests and issues. POPS ensures orthotists, prosthetists, pedorthists and orthotic fitters in Pennsylvania have a voice at a legislative level. POPS membership supports legislative initiatives on Insurance Fairness. POPS board members work closely with legislators and CMS to ensure your interests are protected and communicate new information related to your field. POPS Director of Legislative Affairs Randy Stevens has a seat on the PA licensing board. He attends their monthly meeting and is on the licensing committee. His voice ensures the interests of Orthotists, Prosthetists, Fitters and Pedorthists are protected at the state licensing board level to ensure quality of care for the services we provide. Randy Stevens is available for any practitioner who has questions on interpreting the licensure law or is having any issues getting their license.